A lot of you have probably heard of a “First Look” on the wedding day. It has become more popular over the years for a lot of reasons! 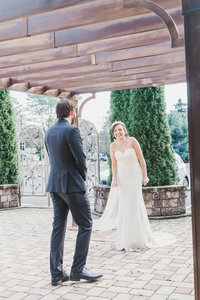 The First Look is when you choose to see each other on the wedding day before you walk down the aisle and have your bridal portraits taken in a more relaxed, intimate environment. There is something very special about shooting a first look, especially when you get a couple that is so in love with one another. I get it. You’re probably on the fence about whether you should have a first look on your wedding day or not. You have dreamed of that one moment since you were a little girl, that first look moment of you walking down the aisle to marry the love of your life – guess what… that moment is still going to happen!! I’ve been photographing weddings for 4 years now and continue to find that weddings that include a first look run much smoother for SO many reasons that will BENEFIT you! We get so many emails from nervous brides questioning whether they should have a first look, and our answer is always YES! Here are 5 things I want you to think about before deciding a firm no on the whole first look idea. Of course, I may be biased on this one. Your wedding photography will be your best source of memories from your wedding day that you can hold onto forever. 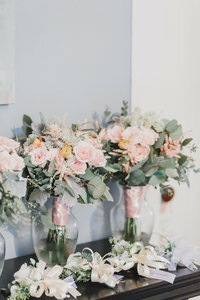 Most of the time, brides schedule their wedding timelines pretty tight, for example – ceremony 4:00, cocktail hour 5:00, introductions 5:30, then you usually have the first dance and parent dances right after the introductions and then dinner is served. What about portraits?! By that time, it may be dark out (if during the fall/winter). If you decide not to do a first look then that means you only have that one hour to get family formal photos, bridal party photos and bride & groom portraits. Trust me, that hour flies by, and being rushed for portraits only adds unneeded stress to your day. You are investing so much into your wedding photography that it would be so upsetting if you don’t have any great bride & groom portraits to frame around the house! Lets say you booked your cocktail hour to be immediately after the ceremony then followed by one hour of cocktail hour until introductions. Again, if you decide not to do a first look then that means you only have one hour to get family formal photos, bridal party photos and bride & groom portraits. Most likely, you’re going to be very hungry after the ceremony.. all day there is so much to think about and so many things that need to get done before the wedding like hair, makeup, getting dressed and some portraits, of course, that you may not have time or simply just forget to eat! Also, cocktail hour gives you the opportunity to use that time to relax with your wedding party privately or greet and thank your guests for coming rather then wasting precious time during the reception (trust me, SO many brides and grooms don’t even get to enjoy the meals they paid for because they’re so busy saying hello to everyone!). Also more time to enjoy that signature cocktail you chose! First looks are typically a private, intimate moment you get to have with each other (unless you want to include your bridal party). Truly, there isn’t much time, assuming any, during your wedding day that you and your partner will be able to spend some alone time together. Being able to enjoy and savor that first moment of seeing one another on your wedding day privately is so valuable, because for the rest of the day you will be surrounded by family and friends constantly. Being able to hug, kiss, laugh, cry, smile etc and not feel like you have to hold back, and having that instant reaction and special moment documented will surely be one of your most favorite moments of the day. Most couples are extremely anxious before walking down the aisle. Obviously you’re excited, however nervous none the less. 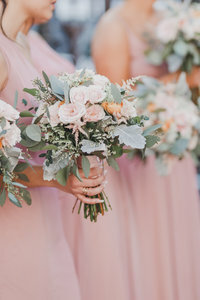 A good amount of couples are still against opting for a first look since they believe it’s misfortune for the groom to see the his bride prior to the ceremony or they feel that the special moment of walking down the aisle will be taken away. (spoiler alert; it won’t!). If the grooms first time seeing you is during the ceremony, there is no chance to get for him to reveal to you how beautiful you are, that he is so eager to be your other half, or kiss you passionately. He would have to wait until after the ceremony is over, after the greetings have been done, after the family and wedding party portraits he would have to wait a good 40-90 minutes after he has first seen you! So just because he has seen you before the ceremony doesn’t imply that he wont be filled with joy and anticipation when you begin walking down the aisle. If anything, he is more excited now than anxious! While we really love them and will always recommend doing them, we would never push any of our couples to a first look. Ultimately, this is YOUR wedding day so it’s YOUR decision. I fully support first looks because I know they help ease nerves, provide you with more photos and get you back to your family and friends faster. If a first look isn’t for you, that’s okay! Just make sure that you have a timeline created and leave enough room for portraits after the ceremony and before the reception without feeling too rushed or overwhelmed. And don’t forget Fall and Winter months start getting dark much earlier! I 100% agree. I had plenty of time to relax and get what were my favourite portraits done before the ceremony. I loved being able to hold and kiss my soon to be husband in a more intimate setting. I still cried and he still had tears in his eyes as I walked down the aisle to marry the man of my dreams. Thanks you Michelle and Nick for all the beautiful wedding photos.